Copy -- the written words you choose -- can have a dramatic impact on referral campaign performance. Here are some tips to make sure you're set up for success. Tip #1: Verb + What’s in it for them? A really simple way to create an effective call to action is to pick a verb and follow it with an offer, or more specifically, what's in it for them (WIIFT). In other words, what's the upside for the customer to send their friends to your site to buy something? All of these examples follow the rule outlined above. The same examples above apply to this rule as well. Don’t obfuscate or get wordy in your widgets. Just get to the point. 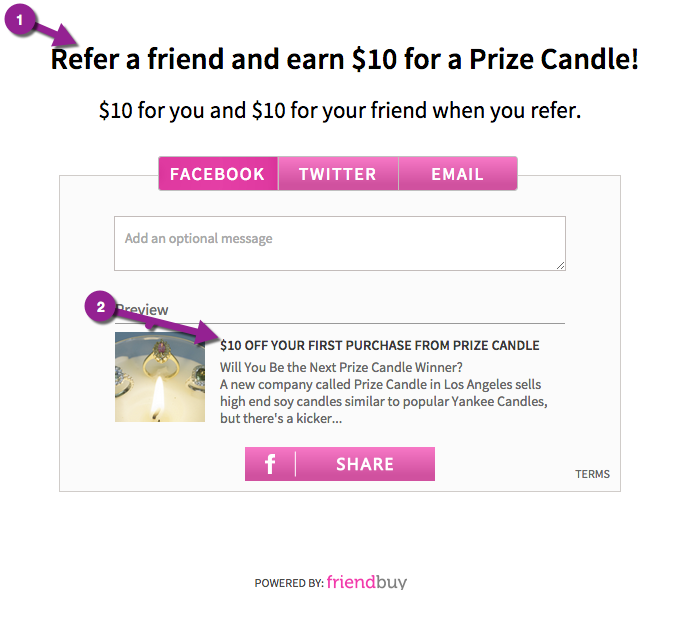 It should take 5 words or less to explain the referral reward for the sharer as well as the offer for their friends. Check before you go live to make sure you're addressing both (below). Double check your widgets before you go live to make sure you have a call to action for the referrer as well as their friend. It's easy to get excited about increasing the amount of sharing and referral messages your customers will send out, but don't neglect their friends -- give them a reason to visit and buy from you, too. Make sure there is a call to action in the shared content (the copy and images posted to Facebook, Twitter and email). 1) Clear call to action to the referrer, starts with verb followed by what's in it for them (WIIFT). 2) Clear call to action to the friend, starts with verb followed by what's in it for them (WIIFT).